macro BethFish at her best. You can tell it's springtime (and May), flowers are a very popular theme! Magnolias are gorgeous but boy are they high maintenance. I prefer to enjoy them in someone else's yard. Such a pretty flower. A shame they don't last very long. All the Magnolias here burst into bloom a few days ago. That is lovely! I'm glad you're finally getting some spring up there! Love the delicacy you captured in the veining of the petals! Oh wow! That is absolutely gorgeous! So gorgeous! 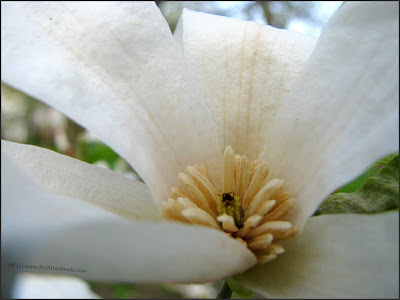 I love magnolias but have never been able to grow them successfully here. Spring flowers do fade much too quickly. Nice pictures help us to enjoy them a bit longer. Since flowers fade, a photo is the next best thing! Preserved forever! Lovely! what is that beautiful flower? That's a cool picture. I hope you didn't get stung. Gotta love magnolias... That's a beautiful shot!